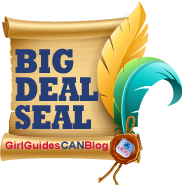 We are so happy to announce the GirlGuidesCANblog Big Deal Seal winners – our guest bloggers whose posts have inspired, engaged, enlightened and entertained us most! These winners will be awarded an online seal for their post on our GirlGuidesCANblog, that can also be used on their own blog or website. The winners were chosen by subscriber votes from our top 25 posts for our inaugural year (May 1, 2011 – April 30, 2012*), which were ranked based on the total number of views. Category 1: Guiding Greatness: I Camp Therefore I Have My Camp Blanket by Sarah L.
Category 2: Growing Guiding – It’s a tie! Category 5: Reader’s Choice: Why I Plan on Being Guider Extraordinaire by Chantal S.
We want not only to say congratulations to them but also a big “thank you” to all of our guest bloggers and to YOU, our loyal readers and all our wonderful contributors! Because of you, GirlGuidesCANblog has grown and flourished, and yesterday reached 70,000 all-time views since the launch of the blog in February 2011. During the month of May we also increased our blog audience by 35%, and our email subscribers by 24%. Our biggest increase however was in blog post pitches which increased by 59% – Whoohooo! Even with that success, we still want to hear from you. So if you have an idea for a great blog post send us your pitch and maybe next year you’ll be in the running for a Big Deal Seal!